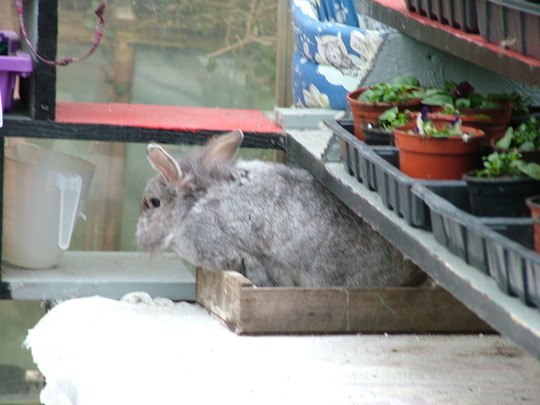 Donnah your rabbit is gorgeous and looks so happy sitting there, lol. I like the cream ones best. What an artistic lot you are,Goyers. 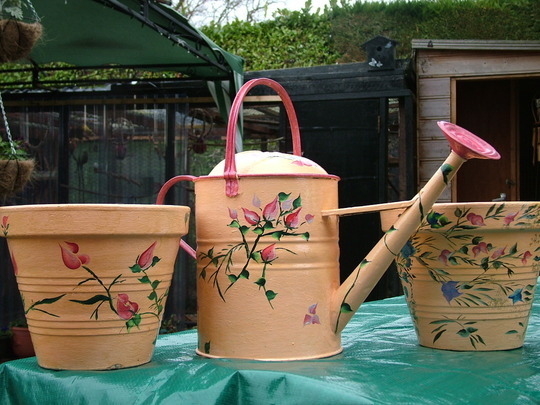 Are all your painted pots terracotta Donnah? Have you managed to paint any plastic ones? Do you need to prime them with anything? 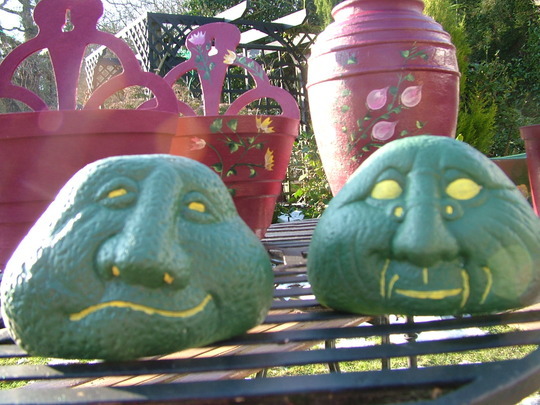 This would be a good way for me to spruce up some of my friends pots (who's on a limited income) Shes had some of her pots for years and they could do with a bit of a lift - Wont be as artistic as yours though. 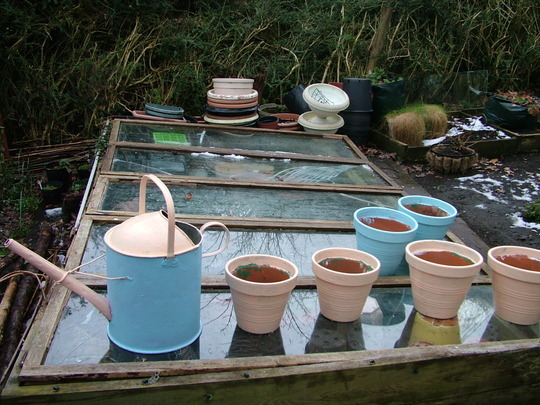 Love your pots Donnah - and your greenhouse. Hiyah..What an imaginative creative talent you have donnah, they all look Amazing, Clever, Clever you. 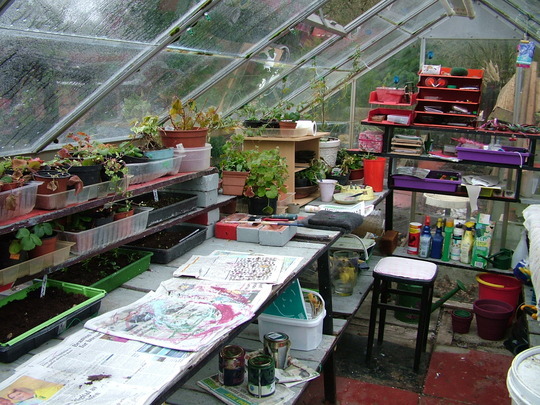 Love your Greenhouse, looks a great place to work in.. Very nice, almost too good for putting plants in, love the watering cans. I have been painting plastic ones as well Poppt lover. I give all the pots a couple of under coats with maysenry paint. I have never done this sort of painting before I have been watching vidios on u tube and copying what they do. Its a great way to learn because you can stop the vidio and copy what they are doing. Its called one stoke painting and i sit in front of the computer with paints and paper and practise till I feel confident with what I am doing ,then I try it out on a pot. At the moment I am painting an old wheel barrow up. Well you completely transformed that old boiler! It looks great. Show us some more once theyve gone where you want them and planted them up??? Be great to see. 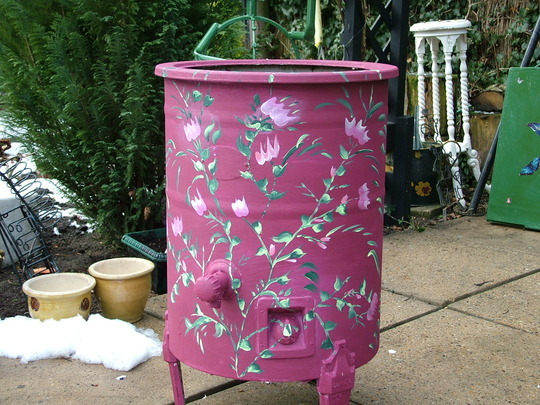 I can think of a few things in my garden that would benefit from a bit of paint! Donna this is fantastic make over and beautiful. I have a lovely shape large plastic pot but its looking faded and tatted so . 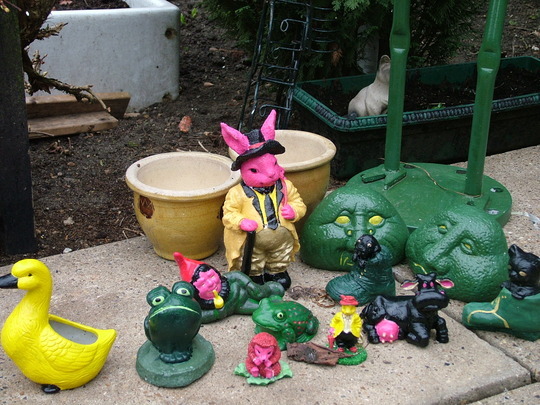 Would love to try this and got a stone rabbit planter and the paint is coming off . It was a gift 15yrs ago. What a great idea Donnah, I have some masonry paint in my garage, you have inspired me, not sure I could get them looking as good as yours though ! Those floral pots are most impressive Donnah,time very much well spent. Husband has just set up the base for our first greenhouse. Hope mine looks as productive as yours by the end of the year. 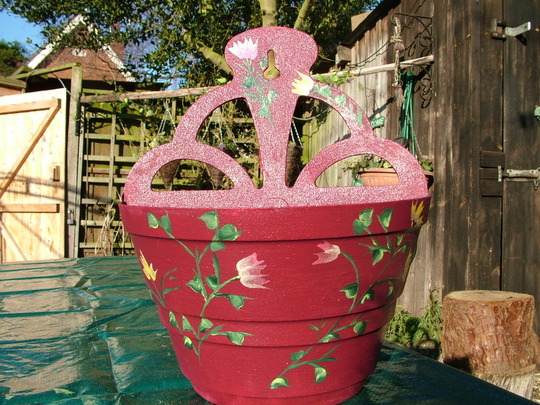 Wow, I love the pots, Donnah, I think you have real talent and patience. My favourite is the tall dark red pot, what a lovely centre piece that would make. 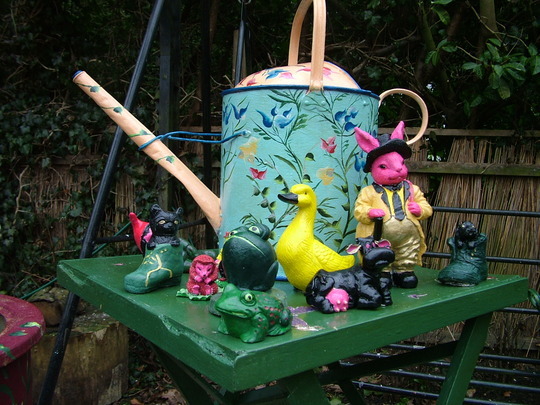 A fab idea - I love the pots and watering cans - you are a real talented lady!! 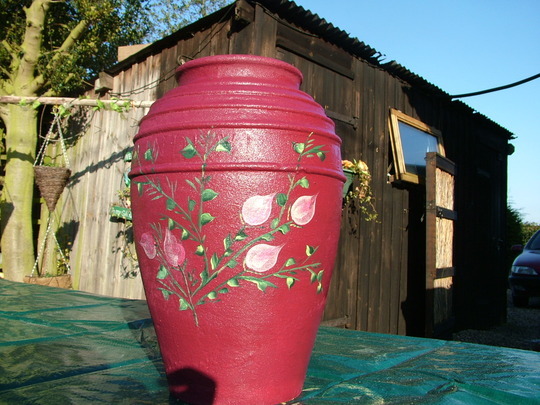 Lovely pots and a natural talent.What paint do you use after the masonry paint,..acrylic ? Do you varnish for protection..yacht varnish or acrylic varnish ? 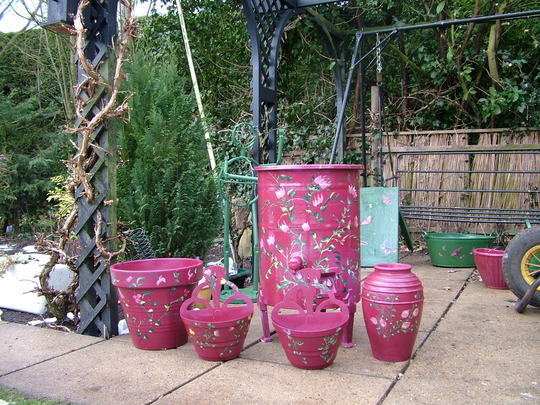 Love these pots I have lots of plastic pots, Do you have to repaint every year or put them away for the winter ? Only just found this blog. Donnah they look amazing. One stroke painting is a brilliant technique. I had a go at it several years ago (just on paper). We brought a video set (shows how long ago it was lol) of instructions. Never crossed my mind to try it on pots though. 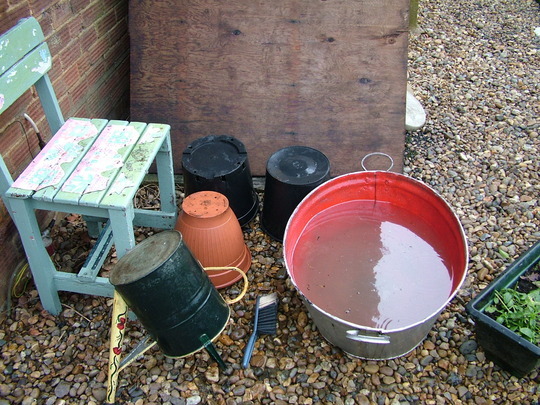 Thanks for the inspiration, wil have to have a go on a big old plastic pot we've got.